Hi everyone I hope that you all had a great weekend and you are ready to tackle Monday. One thing I love about Monday’s is that it is the start to an entire new week of creating outfits. Speaking of creating new outfits today i’m styling a new boot trend. Socks boots are really popular this year and I can see why. As soon as I put on these beauties I thought about a million outfit ideas. 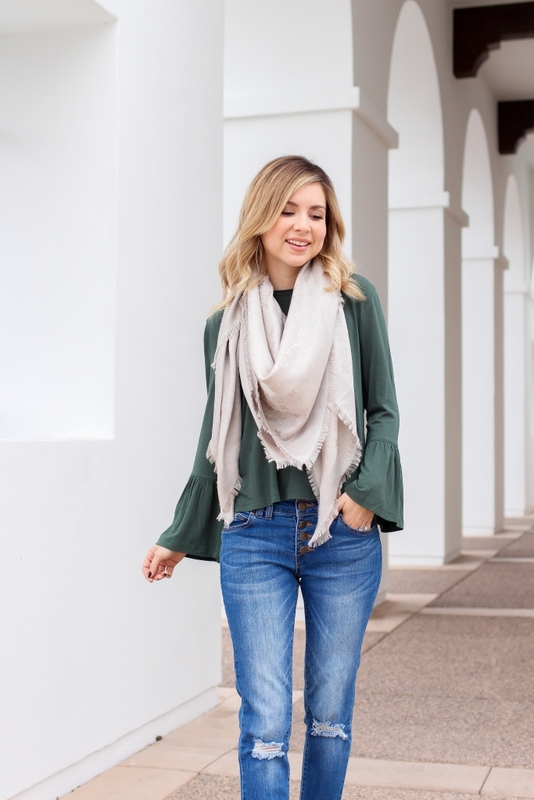 For my first way to wear these boots I paired them with hem jeans and this green bell sleeve top. 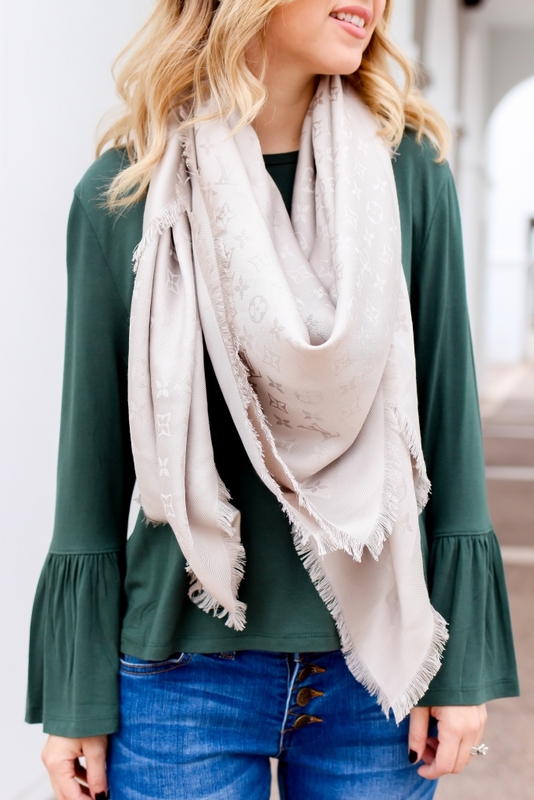 I have to mention that this festive green top is on sale for only $17. This top also comes in black but both colors are running low in stock. I love how the uneven hem jeans make the sock boots standout more. To top off this look I added this Louis Vuitton monogram scarf. I’m looking forward to wrapping this scarf around me all the time. Another great way to wear these socks boots are with a dress. I recently shared these boots with a darling knot front dress ($55) and it look stunning. So many compliments! If you are looking for a date night option this one is perfect. Hopefully with these ideas on how to wear sock boots you give this trend a try. I know there are lots of different styles when it comes to these boots but with the block heel these are really comfortable. Christopher and I spent a lot of the weekend putting up christmas decorations and spending time with the puppies. I’ll have to remember to share the christmas tree with you all this week on Instagram. Also I’v had some questions on black Friday deals and i’m going to be sharing a few of my faves come Friday plus a try-on session. Love the cute yet subtle bell sleeves on that top!